PULLMAN, Wash.—Washington State University physicists have found a way to write an electrical circuit into a crystal, opening up the possibility of transparent, three-dimensional electronics that, like an Etch A Sketch, can be erased and reconfigured. The work, to appear in the on-line journal Scientific Reports, serves as a proof of concept for a phenomenon that WSU researchers first discovered by accident four years ago. At the time, a doctoral student found a 400-fold increase in the electrical conductivity of a crystal simply by leaving it exposed to light. 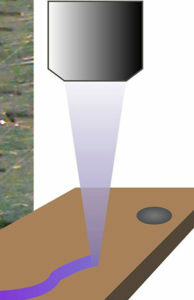 Matt McCluskey, a WSU professor of physics and materials science, has now used a laser to etch a line in the crystal. With electrical contacts at each end of the line, it carried a current. Ordinarily, a crystal does not conduct electricity. But when the crystal strontium titanate is heated under the right conductions, it is altered so light will make it conductive. The phenomenon, called “persistent photoconductivity,” also occurs at room temperature. This makes it easier to improve conductivity than cooling materials with liquid nitrogen, another focus of research. “We’re still trying to figure out exactly what happens,” said McCluskey. He surmises that heat forces strontium atoms to leave the material, creating light-sensitive defects responsible for the persistent photoconductivity. McCluskey’s recent work increased the crystal’s conductivity 1,000-fold. The phenomenon can last up to a year. 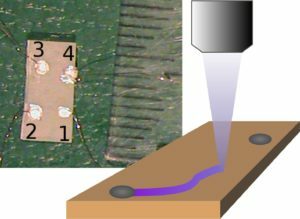 Moreover, the circuit can be by erased by heating it on a hot plate and recast with an optical pen. The research was funded by the National Science Foundation. Co-authors on the paper are former students Violet Poole and Slade Jokela. The work is in keeping with WSU’s Grand Challenges, a suite of initiatives aimed at addressing large societal problems. It is particularly relevant to the challenge of Smart Systems and its theme of foundational and emergent materials.